After having enjoyed Thanksgiving with our loved ones, we are almost immediately reminded to purchase holiday gifts for our family and friends. Commercials tell us the only way to save money on holiday shopping is to purchase our gifts early in the season. Chances are, many of us will go through a tank of gas while circling the parking lot of an overcrowded mall and then impatiently wait in line hoping to save a few bucks. Spend that time and money creating edible gifts your loved ones will cherish right in the comfort of your own home. It’s a great way to save gas, money and time while not having to cut anyone off of your “nice list”. Flavored Popcorn– Make various homemade flavors such as truffle rosemary, add salt and sugar for a sweet and salty combination, dried chives, parsley and cheese, or even drizzle with chocolate, nuts, cinnamon and coconut flakes. Place more than one flavor in a tin for variety. Personalized Herbal Tea– Mix their favorite calming herbs in a tea bag, tie with a string, tag and wrap delicately, or add tea mixes to decorated and labeled jars. Chocolate Bark– Choose between white, dark or milk chocolate and decorate with re-hydrated berries, nuts, coconut flakes or peppermint. They’re easy to make, can be delicately wrapped in cellophane and a ribbon. Cookies, Macaroons & Biscotti– Never underestimate the power of a cookie. Make your own seasonal biscotti with your favorite nuts and dried fruit or festively decorate sugar cookies. Drizzle macaroons with melted chocolate or caramel for added flavor. 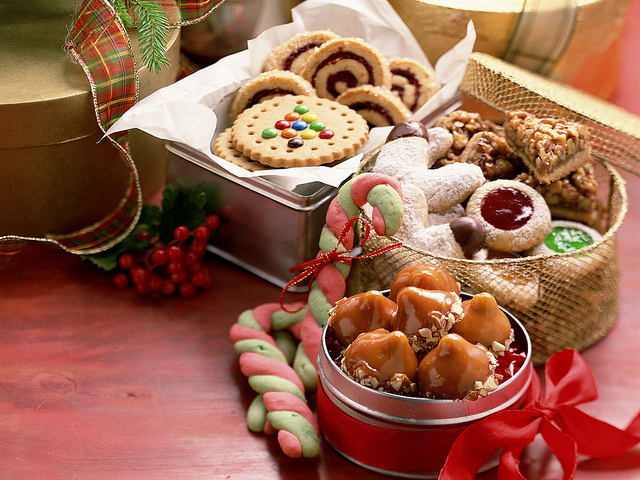 Create a cookie sampler. Toffee, Peanut Brittle, Fudge and Taffy– Reminisce in sweets that bring you back to the boardwalk. Use flavors that represent winter such as homemade peppermint taffy and pumpkin fudge. Trail Mix, Honey Roasted and Spiced Nuts– If someone you know is nuts about nuts, homemade trail mixes, honey roasted and or maple spiced nuts are always a crowd pleaser. Infused Oil & Vinaigrette– Infuse olive oil with rosemary, truffle, sage, basil or other herbs. Create your favorite roasted shallot or maple walnut vinaigrette and reserve in a clear salad dressing bottle. Place bottled oils and vinaigrettes in a decorated basket. Infused Vodka– Pumpkin spice, fig, vanilla, pepper, citrus and even Skittles infused vodka! The possibilities are endless when it comes to infusing this particular liquor. Jams, Jellies and Marmalades– Aside from being so simple to make, these are gifts that have a long shelf life, can be used for breakfast, desserts and more. After being sealed in a mason jar, label with festive wrap, bows and or ribbons. Mix-In-A-Jar– Measure out ingredients for a simple yet delicious brownie, bread, cookie, cake or even soup recipe. Layer the dry ingredients in a mason jar, seal and decorate festively. Don’t forget to elegantly write the needed additional ingredients such as milk or eggs along with the baking directions and temperature on a small sticker or tag attached to the jar. Homemade Granola or Granola Bars– For the health conscious friend, add honey, oats, toasted pumpkin seeds and maybe even a few white or milk chocolate chips to the bars. Place granola in a jar and the bars in a lovely clear bag with a neat bow. Homemade Extracts– Store bought extracts aren’t always cheap, and the difference between fresh and preserved is astounding. Save your friends money by making homemade vanilla, coffee, lavender, coconut, almond or citrus extracts. Make more than one flavor, reserving and labeling in small bottles, wrapping various flavored extracts per recipient. *Reminder*– ALWAYS make sure your gift recipient does not have any food allergies BEFORE wrapping their present. This is a great list of suggestions, some of these are just perfect for certain people in my family and there are a few that I had not even thought of. Thanks for this helpful post!